Twelve perecent of all U.S. homeowners are behind in their mortgage payments are in forclosure, including a stunning 48 percent of those with subprime adjustable-rate mortgages, new data showed Thursday. The reckless lending practices in states like Florida, California and Nevada that were the epicenter of the housing crisis are no longer driving up the nation's delinquency rate. Instead, the foreclosure crisis now is being fueled by a spike in defaults in states like Louisiana, New York, Georgia and Texas, where the economies are rapidly deteriorating and thousands are losing their jobs. A record 5.4 million American homeowners with a mortgage of any kind, or nearly 12 percent, were at least one month late or in foreclosure at the end of last year, the Mortgage Bankers Association reported. That's up from 10 percent at the end of the third quarter, and up from 8 percent at the end of 2007. Prime and subprime fixed-rate loans saw sharp increases in the fourth quarter, a sign that the problem is now the economy. "We're seeing increases in fixed-rate categories and that's where the problems are coming from," said Jay Brinkmann, the group's chief economist. 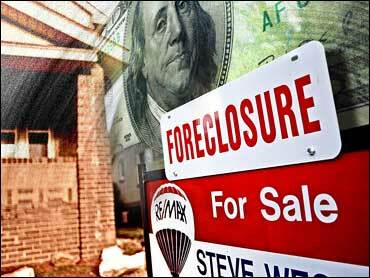 "The foreclosure picture is more clearly driven by the jobs market." That trend highlights one of the biggest challenges confronting the Obama administration's mortgage relief plan launched this week. While the $75 billion plan could help change the loan terms or refinance up to 9 million homeowners, unemployed borrowers will have a hard time qualifying. On Thursday, the Labor Department said new unemployment claims last week totaled 639,000, lower than expected, but still at elevated levels. Factory orders also slipped for the sixth month in a row in January, the Commerce Department reported. "There can be no doubt that employers continue to shed labor at a frightening pace, with no end in sight," Ian Shepherdson, chief U.S. economist at High Frequency Economics, wrote in a client note Wednesday. The key is what kind of workers are losing their jobs, Brinkmann said. Unemployment for people with college degrees, some college education or technical training - those most likely to own homes and have prime fixed-rate loans - has nearly doubled over the past six months. In New York, for example, where the financial industry is handing out pink slips like ticker tape, homeowners who once had good credit are defaulting at an increasing clip. The only bright spot in the report is the devastation wrought by subprime ARMs appears to be waning. Their 30-day delinquency rate continues to fall and is at the lowest point since the first quarter of 2007. That offers little reassurance to Florida, where 60 percent of homeowners who have a subprime ARM are at least one payment behind and one in five of all mortgage holders aren't current. On Wednesday, Mr. Obama's team announced details of his plan, which features cash incentives for mortgage holders - known as loan servicers - who cut deals with borrowers for new, more affordable terms. The legislation has been the subject of an intense lobbying campaign by the financial services industry, which has worked hard to kill it. It has exposed rifts among liberal Democrats who regard it as the only real way to help debt-strapped homeowners avoid foreclosures and moderates who want to give voluntary efforts a chance to work before resorting to the courts. The same divisions are at work in the Senate, which is expected to consider its own version of the legislation in the coming weeks. The industry already won several concessions from Democrats in the House, who agreed to limit the measure to existing loans, to homeowners who sought a loan modification from their lenders before filing for bankruptcy, and to people who can no longer afford to pay their mortgages. Democrats were forced to put off action on the measure when moderates voiced concerns last week that the bill was still overly broad. They wrote a compromise that requires bankruptcy judges to consider whether banks offered homeowners reasonable loan restructuring deals before they weigh in with their own rewrites. Borrowers also would have a responsibility to prove that they tried to modify their mortgages with their lenders before seeking help in bankruptcy court.